Leave the snow outside and join us in the comfy, cozy warmth of “Coronado Coffee Shop” where everyone comes to share in the festive fun and celebrate with a song or two. Get your cool yule ON with your friends at Coronado Playhouse enjoying seasonal classics like Silent Night, I’ll Be Home For Christmas, Surabaya Santa, Baby It’s Cold Outside and many, many more… Sean Paul Boyd directs and Kirk Valles leads the music in this one-night-only feel-good holiday cabaret. And don’t miss your chance to win a Coronado Playhouse gift certificate by wearing your most guady and ugly holiday sweater when you attend the cabaret! SEAN PAUL BOYD (Director) Sean Boyd is an associate member of the SDC, the labor union for professional stage directors and choreographers, and is delighted to be back at the Coronado Playhouse. He has performed on their stage in The Best Little Whorehouse in Texas and Pageant. Recent directing credits include: The Two Musketeers, A Bad Year for Tomatoes, Duck Hunter Shoots Angel (Trinity Theatre); Alexander and the Terrible, Horrible, No Good, Very Bad Day (San Diego Junior Theatre); The Wizard of Oz, Disney’s 101 Dalmatians (San Pasqual Union School & LMSVSD). He has also performed locally at Cygnet Theatre, North Coast Repertory Theatre, Trinity Theatre, and a Collaboration project with San Diego State University and the La Jolla Playhouse. Much love to Megan, Mom, Dad, Joanne, and Connor. 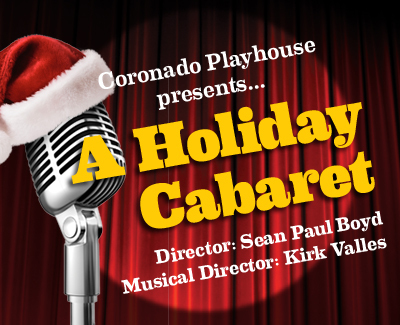 CORONADO, CA – Coronado Playhouse, the Community’s Theatre, closes out its 70th Anniversary Season with A Holiday Cabaret on Sunday, December 11, 2016 at 7 pm. Featuring many of CPH’s favorite performers, the stage will be transformed into a “Coronado Coffeehouse” with a piano, open microphone and plenty of the season’s most popular songs for the most wonderful time of the year. Audiences are invited to relax in a casual setting with cocktails or coffee and sing along to classics that include The Christmas Song, Jingle Bell Rock, Baby It’s Cold Outside, Silent Night and an original song Dance With Me Santa. Coronado Playhouse has assembled the creative team of Director Sean Paul Boyd and Musical Director and Kirk Valles to lead this holiday event. Tickets are $20, general admission, and are available through Coronado Playhouse’s Box Office at (619) 435-4856 or online at www.CoronadoPlayhouse.com. For additional festive fun, enter our contest by wearing your favorite ugly Christmas sweater to the cabaret event! The gaudier and more creative, the better. The winner will receive a gift certificate for two tickets to any show during Coronado Playhouse’s 2017 Season. Please contact M.G. Perez for specific media interest and needs. Coronado Playhouse is a qualified 501(c) 3 non-profit organization as San Diego County’s longest running community theatre.